A lined cusive font with connecting letters. 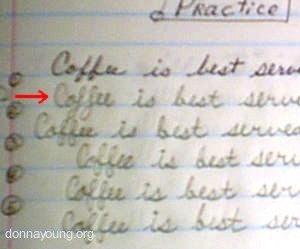 To make ruled handwriting paper, use the \ key. To make a leading tail, use the | key. 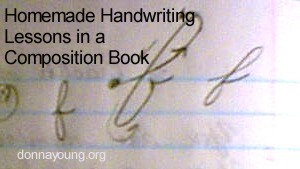 See this page to learn how to make Homemade Handwriting Lessons in a Composition Book. The article seems to be about cursive handwriting, but it is not, it is about making a handwriting notebook and the things to consider when making the notebook. I used the left side pages of the book to trouble-shoot troublesome letters. The "f" first drawn incorrectly, is drawn correctly on the remaining sentences.